Blyth Spartans’ inability to beat Nantwich Town continues after the two side’s drew 1-1 in Cheshire on Tuesday evening. However, they will not come as close as they did with a dominant display at the Weaver Stadium. But a point was all they could take thanks to Dan Maguire’s 20th goal of the season as the striker got his side back on level terms after Matthew Kosylo had given the hosts the lead. Spartans had all of the early pressure and created two quickfire chances. In the second minute some neat interplay between Maguire and Jarrett Rivers allowed the latter to fire a shot at goal from the edge of the area which was comfortably saved low down to his left by keeper Terry Smith. That was quickly followed a minute later by a curling effort from Michael Richardson as the midfielder tried to find the top corner with a curling effort from 20 yards but it just evaded the angle of bar and post. But despite their early pressure Spartans could not force an opening goal and they were punished ten minutes in as the home side took the lead through Kosylo. The winger was played in by an incisive through ball from Telford United loanee Sean Cooke and Kosylo made no mistake with a low effort that Nick Thomson got a hand to but could not prevent from going over the line. Five minutes after falling behind Spartans almost got back on level terms with a wonderfully worked move. Arran Wearmouth burst down the left and played the ball through the legs of Shaun Dowling before reaching the byline. His pull-back found Richardson and the midfielder smashed a low, left-footed drive towards the near post but it was tipped wide by Smith. The match was end-to-end and only the alert defending of Jordan Watson prevented Cooke from doubling the home side’s lead. The tricky wing play of Kosylo took him past Alex Nicholson and his pull-back caused chaos in the Spartans area and the loose ball ran to Cooke, but his low drive from eight yards was blocked and cleared from the line by Watson. With half-time approaching Spartans were on top and as Ryan Hutchinson flicked a header goalwards but Dabbers keeper Smith tipped it around the post. From the resulting corner Danny Parker headed into the six-yard box and Maguire spectacularly scored the equaliser Spartans deserved with an overhead kick from the edge of the six-yard-box. As the opening half moved into injury time Spartans almost took the lead with a goal of the highest quality. A lovely flowing move involving Nicholson, Hooks and Rivers led to a neat flick from Richardson releasing Maguire in on goal and his low drive was tipped around the post by Smith. A pulsating game carried on after the interval with Spartans creating the first chance ten minutes in. Rivers caused havoc by running at the Dabbers back four before releasing Nicholson down the right and the full sent in a first time cross across the face of goal but neither Wearmouth or Maguire could get a decisive touch. Spartans maintained their attacking intent and again got into their stride playing some attractive stuff. Nicholson linked up with Maguire to give Richardson a chance to have a shot at goal from the edge of the box but the midfielder fired over. The game continued in the same fashion with Spartans dominating and Danny Parker came within a whisker of giving them a deserved lead. A Richardson corner from the left was flicked just past the far post by the centre back. The only riposte from the hosts came from a long distance effort by goalscorer Kosylo, but that was easily taken care of at the second attempt by Thomson. With the game going into injury time Spartans looked as if they were going to get a winner, and if any side deserved it then it was Tom Wade’s men. A ball into the area found Richardson and his clever back-heel was just out of reach of substitute Ash Davis and ran into the hands of Dabbers keeper Smith. As the full-time whistle blew it was no doubt the home side who were grateful for the point as Spartans’ second half dominance deserved all three points. But a hard earned point was all they had to show for an excellent performance as they played some breathtaking football at times. 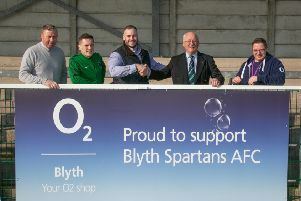 Blyth Spartans: Thomson, Nicholson, Watson (Bell 45), Parker, Hutchinson, Hooks, Richardson, Wade, Rivers, Maguire, Wearmouth (Davis 79). Subs not used: Steven Turnbull, Cummings, Mullen. On Saturday Spartans entertain Rushall Olympic at Croft Park, kick-off 3pm.